It started with a heartbreaking loss, the kind you struggle to put behind you. Then it ended so much sooner than it should have. The McGill Redmen’s fourth trip to the Canadian Interuniversity Sports men’s hockey championships in the past five years lasted only two games, both of them losses of the hard-to-swallow variety. The Redmen, winners of the Ontario University Association’s Queen’s Cup, had dreamed of much bigger things. They arrived at the national championship Cavendish University Cup, hosted by Lakehead University in Thunder Bay, Ont., as the No. 2 seed. And for the first two periods of their opening game against the University of Manitoba Bisons on March 25, there was every reason to believe they’d be playing for a national title on Sunday night, March 28. The third period started with McGill in a commanding 4-1 lead. But a power-play goal at the 3:55 mark by Manitoba’s Kyle Howarth, his second of the game, got the Bisons back in it. A steady, game-long parade to the penalty box eventually took its toll on the Redmen. Then, with 3:18 to play, Bison Mike Hellyer cut McGill’s lead to one, setting the table for a wild finish. With goaltender Steve Christie pulled in favour of a sixth attacker, and the Redmen hanging on for dear life, the Bisons spent the final minute of regulation in the offensive zone creating a flurry of chances, including near misses by Ian Duval and Jared Walker. With only 4.8 seconds on the clock, Duval finally pushed a loose puck past McGill netminder Hubert Morin at the end of a mad scramble in front of the net to tie the game 4-4. The McGill heartbreak was made complete just 1:51 into overtime when Hellyer converted a pass from Duval and fired a shot inside the right post from the top of the faceoff circle. Indeed, the Redmen responded brilliantly in the early going of their game against the St. Mary’s Huskies the next day. 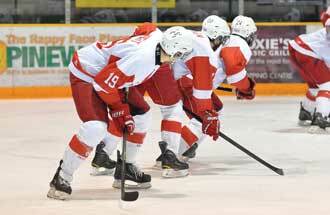 McGill jumped out to a 2-0 lead on goals by Maxime Langelier-Parent and Christopher Longpré-Poirier. But discipline, or a lack thereof, was the Redmen’s undoing once again. Four consecutive goals, including three in a five-minute span of the second period, gave St. Mary’s a 4-2 lead it would not relinquish. The Redmen spent 22 minutes in the penalty box against the Huskies, who connected on one of five power-play opportunities. St. Mary’s went on to defeat the University of Alberta in overtime to claim the Cavendish Cup in Sunday’s title game. Under Jim Webster, who stepped in after long-time coach Martin Raymond left McGill to join the Montreal Canadiens’ organization, the Redmen posted a school record 34 wins in 48 games over all. Notes: McGill’s Marc-André Dorion of St-Hubert, Que., was named defenceman of the year in men’s university hockey prior to the championships. He was joined on the CIS all-Canadian squad by teammate Francis Verreault-Paul, marking only the second time in team history that McGill merited double all-Canadian honours in the same season.